At Girl Meets Dress we know that choosing the perfect bridesmaids dresses is important. Girl Meets Dress have a large collection of specially selected dresses perfect for bridesmaid dresses. Our collections include exclusive Bridesmaids dresses from the UK, so if you are looking for lace bridesmaid dresses or purple bridesmaid dresses GMD have what you need. 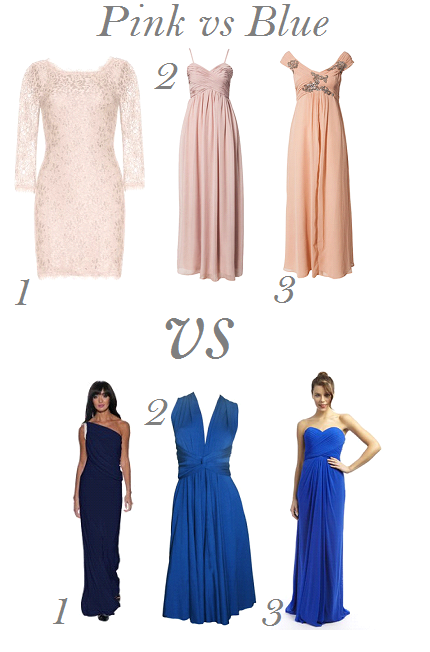 Here are our top picks of bridesmaid dresses in our Pink vs Blue special. This lace dress is perfect for a summer wedding with its romantic lace and chic knee skimming cut. for a more chic bridesmaids look. with the sprinkling of jewels around the neckline. and with the added grecian sleeve style making this the dress to rent if you want to wow. the wrap detail creates a lovely silhouette. its rich blue hue and subtle sweet heart neckline creates the perfect look for an elegant bridesmaid. Posted June 18th, 2014 in Features. Tagged: blue dress, Bridesmaid Dresses, bridesmaid dresses to rent, long dresses, Pink dress, rent bridesmaid dresses, short dresses.